Two children walking arm in arm past the bleaching bones of a herd of cattle. A desperately dehydrated boy crouched over a puddle, scooping globs of messy mud into his mouth. Ribs — goat ribs, dog ribs, human ribs — poking out, exposed. 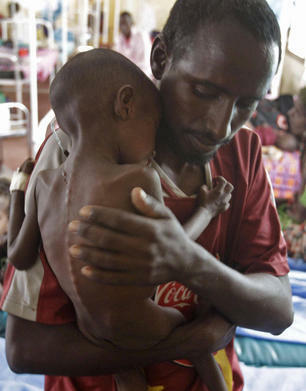 These are the images of hunger in Africa. For years, humanitarian aid organizations have relied on such images and their accompanying stories to inspire well-off foreigners into fits of philanthropy. A dearth of donations in the wake of the United Nation's announcement last week that the drought in southern Somalia has evolved into a full-fledged famine, though, has raised the question: Has the Western world become desensitized to Africa's woes? The number of Somalis in need of urgent food aid has increased by 1 million since January, and is 85 percent higher than at the same time last year, according to UNICEF. Nearly 800,000 children are "acutely malnourished." Despite the UN's pleas to help curb mass starvation, though, officials say the overall humanitarian response has been severely inadequate. A combination of economic troubles at home, a rise in natural disasters and Somalia's tricky political situation have largely pushed the giving public into a state of donor fatigue.